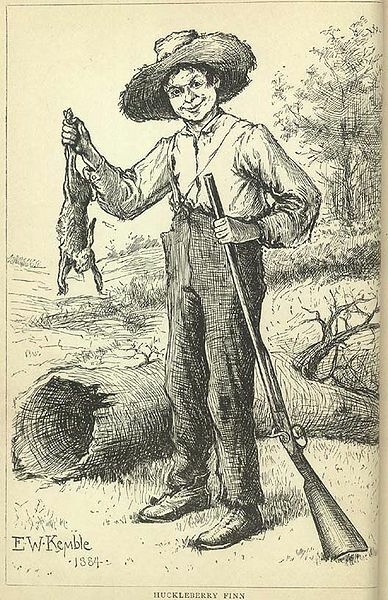 The Adventures of Huckleberry Finn is widely considered one of the greatest American novels ever written, published in the U.K. in 1884, and the U.S. in 1885. It follows upon Mark Twain's earlier novel, The Adventures of Tom Sawyer (1876). This book inspired controversy with its rich local color and often scathing examinations of racism, and some of its chapters have recently been labeled as "dangerous or derogatory content" by Google and the book has been banned by certain academic institutions, ironically for the very themes it exposes which could help, rather than hinder, the social justice movement. The story of Huckleberry Finn abounds with enduring lessons and images and may be Mark Twain's most enduring novel. We feature it in our collection of Books for Young Readers, 25 Great American Novels, and The Unreliable Narrator.